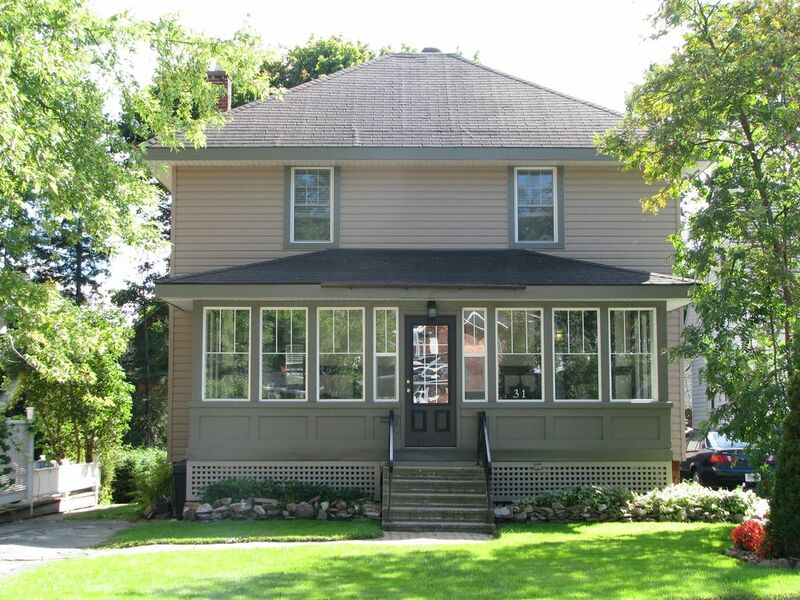 A character home Located in the heart of Sault Ste Marie. Guests are sure to enjoy a memorable stay in this fully furnished home. Gracious first floor with modern kitchen, dining area, living room, and den.Wide baseboards, hardwood floors and lead glass windows. The house has a fully renovated modern kitchen, two new bathrooms, and a new back deck with gas BBQ. Relax in the treed back yard, play lawn games ( games provided ) or toast marshmallows on the fire pit ( wood provided ). You will be glad you chose this over a hotel. We love animals and Pets certainly are negotiable. The area is great for walking, friendly neighbours, old established trees in the yards, sidewalks, and off street parking. Walking distance to downtown area or a 5 minute drive to the malls if you are so inclined. Golf beaches, skiing are all within reasonable distances. If you are a foodie make sure to check out the Italian, Sault Ste Marie has great restaurants that you won't find anywhere else. All dished, bowls, glasses, cups, utensils, serving dishes, platters, etc. Kitchen is fully equipped with everything that you would need to cook a full meal for your family and entertain guests. The house had plenty of space for our group of 7 and came with a fully stocked kitchen and bathrooms. The beds were all very comfortable. The house was conveniently located to many bars/restaurants and only 40 minutes from Searchmont ski area. The hosts were very helpful answering questions about the area and making sure we had everything we needed. Would definitely stay here again. As well, we hope that you enjoyed your poutine and the snow caves on your outing. We really enjoyed our 3 day ski vacation, skied at Searchmont Resort and stayed it this house - it worked really well for us. Nice comfortable house in a great location, we will definitely rent it again in the future. We really enjoyed having you and the Sault brought an extra 25% snow this year just for the skiers! However you are welcome back any time of the year. I have stayed at many homes rented by owners in Canada, the USA and Europe, and this was the best equipped of all of them. I was visiting family in the Soo with my daughter and her baby, and we had all of the comforts and necessities of home. The kitchen was well-stocked, and when I queried the owners about kitchen staples as almost all of our meals were at the house, they told me that there were the basics, but when we arrived we found that the only items we needed to purchase were our perishables and food for our meals. The welcome basket was a lovely touch. The beds were incredibly comfortable, the house was immaculate, and had we been visiting in better weather we would have enjoyed the beautiful back yard and deck. The hosts couldn't have been more accommodating, and we are planning on booking next year when our family travels up to celebrate our mother's 90th birthday. Thanks so much, Sandy and Jim, for allowing us to enjoy your beautiful house! Thank you for your ever thoughtful comments. It was a pleasure having you and your family to stay! Thank you for your suggestions on HST. We were glad we had a few toys to keep James occupied. Looking forward to seeing you next time. Take care until then. We loved staying in the Heritage Home in the Heart of Sault Ste Marie. The home was very clean and every detail was considered from the selection of soaps provided to choice of coffee. The kitchen was well stocked and the beds were very comfortable. We loved sitting on the front porch drinking coffee and walking the beautiful neighborhood. We even walked to the Bushplane Museum. The home is centrally located and is an easy drive to most shopping and grocery stores. When we visit Sault Ste Marie we will be booking the Heritage Home again! Thank you Jim and Kristy for providing the best VRBO we have stayed in over our 15 years of using VRBO. We are glad you enjoyed your stay despite the crazy wind and rain storm occurred! The coffee and soap comments come as welcomed notice as we try to anticipate different guest needs and also like to showcase local business' (Coffee Roasters) All the best in your own rentals and a heartfelt thanks for your review of ours. this place a a reason to visit Sault Ste. Marie! Greet by host. roomy, updated (without loosing arts and craft charm. WONDERFUL fully stocked kitchen with a fridge door full of condiments and a welcome basket with fruit and coffee. My family was in town for a wedding and visted folks in hotels in town. We by far got the best deal and nicest place in the Soo bar none. Visited Loplops lounge and they had great live music. Really glad to hear about how much you enjoyed your stay and the property! I know there were some other tourist type things you didn't get to during your stay. Please know that you are welcomed back anytime to enjoy more of what the Soo has to offer! Griff loves to meet the guests. Thank you for the tour offer on Beaver Island and many thanks for the Beaver Island Wrap! It will keep me warm when I snooze on the couch. Thank you for taking such great care of the place and please feel welcomed to come back anytime. Low season: October 1-April 30. $130.00 per night/$800 weekly High season: May 1-September 31. $150.00 per night/ $950.00 weekly. *prices are based on a family of 4. Additional guests of up to 8 people will be charged a premium nightly fee of $50.00 *December 24-January 2 are charged at the high season rates.